Winner of 2014 Dragons Den Meafod, Spencer Warham from Kilannan Brewing Company Ltd, standing with host JD Moffatt, beside the Dragons. ‘Feels great to support entrepreneurs and the economic development of Meaford.’ says April Stewart from Landlord Legal. Stewart was one of the five Dragons who judged the five contestants participating in the event, which is loosely based on the popular CBC television series, Dragon’s Den. The other 2014 Dragons were Paul Osborn from A2A Capital Management, Desmond von Teichman from Royal LePage, and Carmenie Stemmler, from Grey Bruce Bee Products, Services & Supplies. ‘It’s a real testament that everyone who’s won in still in business,’ says Brick. This year’s winner is Spencer Wareham from Kilannan Brewing Company Ltd. Wareham received $4,000 from the Dragons, $11,525 worth of marketing and business services, as well as the Audience Choice award, which was $1,555 in cash and prizes. Wareham says he will use this to invest in more equipment for his local brewery. The contestant who received the second largest amount of money from the Dragons was Sydenham Hill Farm Leather, a custom hand-made leather shop. Daniel Caldwell presented to the Dragons while Christy Caldwell, his wife and co-owner watched from the audience. 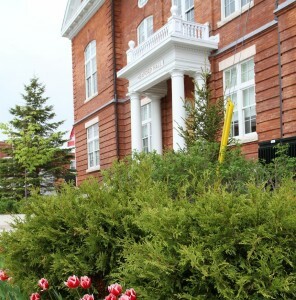 Meaford Hall, where the 6th Annual Dragon’s Den was held. Sydenham Hill Farm Leather received $3,535 in cash, as well as marketing and business services. This was the second year Bill Monahan from HomeButtons has presented to the Dragons. Monahan says through ‘the intervening two years, people would call saying they’d heard of us from the Dragon’s Den. ‘It’s a great way to reach out to the people of Meaford,’ Monahan says. HomeButtons offers independent living solutions to elders and their caregivers, and received $600 from the Dragons. The other contestants were Lynne Lundberg from Transitions, a business focused on the needs of seniors as they transition to smaller homes, and Eric Wilson from Rapid-Fab, a whose primary product is high resolution 3D printing.